Six days ago, through the Grace of the Almighty God, the Coalition for Democratic Change (CDC) was blessed to celebrate our first anniversary as an incumbent political party. On that day, we gave God the Glory, and also gave Him thanks and praise for His Guidance; His Goodness; and His Mercy; without which we would not have been here today, and would not have had the cause to rejoice. I took an oath before you, and before the Almighty God, to uphold our Constitution and to preside over this Government and this country to the best of my abilities. This includes, among others, ensuring freedom of speech and, by extension, freedom of the press; freedom of assembly, revitalizing our economy, rebuilding our infrastructures, providing protection for our people, and ensuring respect for the rule of law. On this auspicious occasion, I must be honest to admit that during the year of 2018, our democracy, society and economy were tested but our leadership rose above these challenges. An Act to Ratify the Financing Agreement to provide additional financing for the West African Power Pool. The amount of this additional financing Agreement is $45.3 Million United States dollars, comprising a grant component of $22.6 million United States dollars; and a loan component of $22.7 million United States dollars. The objective is to support Government’s effort in providing reduced and affordable cost of electricity, that will be efficient and reliable for the Liberian people in both the rural and urban areas. The West African Power Pool Project also seeks to strengthen Liberia’s diplomatic ties and cooperation with our sub-regional counterparts, as the power line runs from Cote D’Ivoire to Liberia and goes to Sierra Leone and Guinea. These two landmark legislations are in line with current national and international realities, and are important for the stability and development of our country. This has paved the way for the friendly Government of India, to assist the people of Liberia in their infrastructural development drive, by building a Modern Convention Center that will host conventions, conferences, and exhibitions, as well as serving as a major tourist attraction. We want to thank the Government and people of India for this kind gesture. Under the Fouta Agreement, the Investor will construct and develop a five hundred (500) tons per day cement plant, expandable to one thousand (1,000) tons per day. This plant represents $25 million United States dollars of new Foreign Direct Investment into our economy, and will provide additional support for our infrastructural development projects. In the case of the Hummingbird Agreement, I am of the firm conviction that we acted in the spirit of ensuring the passage of legislation that will yield the maximum benefits to our Country and People. With regard to the creation of a new district within Lofa County, after careful review and analysis, we came to the conclusion that new statutory districts should only be created after the conduct of a careful study based on the justification, structure, population density, revenue base and economic viability. I also believe that the LOCAL GOVERNMENT ACT will ensure that new statutory districts are not created solely for political purposes or would not impose undue burdens on the National Budget. I look forward to working closely with you to derive an efficient and effective process regarding these issues. AN ACT TO BE KNOWN AS THE KAMARA ABDULLAH KAMARA ACT OF PRESS FREEDOM. This Bill protects people from crimes such as Criminal Libel against the President; Sedition and Criminal Malevolence. It promotes freedom of speech and expression which are important tenets of our democracy. It also promotes good governance, as well as the rule of law. We therefore respectfully urge you to consider the timely passage of this Bill; as well as other Bills essential to our Pro-poor Agenda for Prosperity and Development that have been submitted to you, but remain under deliberations in your Committee Rooms. During 2018, we issued one (1) Executive Order to address a national imperative: EXECUTIVE ORDER NO. 93: EXTENSION OF EXECUTIVE ORDER NO. 87 SUSPENSION OF TARIFF ON RICE. These four pillars, which were the core embodiment of my last Annual Message and Legislative Agenda, are now developed into our National Plan, called the Pro-Poor Agenda for Development and Prosperity (PAPD) and was officially launched on 29th October 2018. The overall objective of the PAPD, and its ultimate goal, is to lift our People from poverty to prosperity. As a first step towards achieving this goal, it is our intention, and our determination, to reduce poverty by 23% percent by the end of 2023, by providing greater income security for an additional one million Liberians who now live below the poverty line. The government, through the Ministry of Education, firstly carried out a review process that included: evaluation of the existing legal and administrative framework; nationwide visits to all schools throughout the country; and the hosting of a national stakeholder’s summit. As a result of this process, several activities were implemented in a bid to enhance efficiency in the education sector. Completion of Curricular revision from early grades through high school. The new curriculum places emphasis on skills delivery, early career pathway and addressing deficiencies in literacy and numeracy. Payroll Cleaning Exercise which netted savings of $2 Million United States dollars as of November 2018. The savings enabled the government to enroll nearly one thousand one hundred (1,100) out of three thousand seven hundred and sixty-four (3,764) teachers who for nearly nine (9) years have been paid irregularly and substantially below salaries earned by other civil servants. Increase the number of scholarships awarded to more than one thousand one hundred and sixty-five (1,165) students, which included one hundred and twenty-nine (129) foreign scholarships, costing the Government a total of $2.5 Million United States dollars. The Government of China and Morocco, and several other countries, awarded bilateral scholarships to nearly one hundred (100) Liberians to pursue studies in those countries. This amounts to a total of one hundred and sixty-three (163) students in foreign countries and one thousand three hundred (1,300) on local scholarships in all universities across Liberia. In 2018 the Government also awarded foreign sponsorship to the seven (7) best-performing students on the 2017/2018 WASSCE Examinations. Under the 2018 / 2019 Public Sector Investment Project appropriation, the Ministry of Education was allocated $4 Million United States dollars for infrastructure improvement and expansion, including the renovation of thirty-three (33) public schools and the refurbishment of fifteen (15) science laboratories in public secondary schools. In addition, seventy-eight thousand (78,000) pieces of modern chairs were purchased for public schools across the country. WASSCE Intervention Program. The government of Liberia paid the WASSCE fees for all thirty-three thousand nine hundred and thirty-one (33,931) 12th graders, and seventeen thousand six hundred and seventy-nine (17,679) 9th graders; amounting to the sum of $2.03 million United States dollars and $41.5 million Liberian dollars respectively, as a means of relieving parents and students of the financial burden associated with the exams, and improve performance. Additionally, to reduce mass failures among 12th graders in the 2017/2018 WASSCE examinations, the Ministry of Education with support from the national government, launched in November 2018 the “WASSCE Intervention Project”, aimed to improve Liberian students’ performance on the 2018/2019 examinations. The project provides Saturday tutorials for all 12th graders in the country, free of charge. The cost of the project is a little over three hundred and fifty thousand ($350,000) United States dollars. HONORABLE MEMBERS OF THE 54TH LEGISLATURE, in addition to the interventions made by the government to shift the paradigm for a better education system, we also received strong support from our international partners to the Education component of the Pro-Poor Agenda for Prosperity & Development (PAPD). The World Bank IDA made a grant/loan of $25 Million United States dollars for investment in Public Secondary Schools, including construction, rehabilitation, setting up of laboratories, provision of teachers’ residences in rural school communities, girls retention through secondary school, and a host of other interventions helpful for secondary school children. the initial amount, making a total of $17 million United States dollars, all of which have been dedicated to the development of Early Grade Schools. THE EUROPEAN UNION MADE AN INVESTMENT OF 20 MILLION EUROS, dedicated to the development of Technical Vocational Education in Liberia. The project will benefit all youth, whether enrolled in school or out of school, through the Ministries of Education and Youth & Sports. An additional 12.5 million Euros, previously set aside by the European Union for Out-of-School Youth, is being requested by the Ministry of Education to expand and continue the investment in vocational education (formal & informal). That application, when approved and finalized, will bring to 32 million Euros which will be targeting vocational education in several counties. The Swedish Government has also committed itself to investing approximately 5 Million Euros for Vocational and Skills Education in Liberia, designated specifically for reconstructing and equipping the Voinjama Multilateral High School which was destroyed during the war. The current commitment of the USAID to Education aggregates to $60.9 Million United States dollars. The USAID investment comprises $27million United States dollars for the READ LIBERIA PROJECT, and $33.9 Million United States dollars for the ACCELERATED QUALITY EDUCATION PROGRAM. These two amounts, separately designated for education development by USAID, are designed to enhance early grade reading, particularly for Grades 1 & 2, and enrolling out-of-school children into learning programs, which is estimated to benefit forty-eight thousand (48,000) children residing in six (6) counties. INVESTMENT OF $30 MILLION UNITED STATES DOLLARS IN SCHOOL FEEDING PROGRAMS FOR 5 YEARS. The School Feeding Program which is ongoing as of 2018, is expected to benefit over one hundred thousand (100,000) school children in 240 primary schools situated in four (4) counties, primarily in the South-Eastern counties of Liberia, because of their special situation. Therefore, the Government of Liberia, through the Ministry of Youth & Sports, sees the provision of skills and sustainable employment to young people as matters of strategic importance for transformation of Liberia and placing the country on a path to sustained peace. We have therefore focused on several key strategic interventions to alleviate some of the issues in Youth Employment and Empowerment and Sports Development. We have completed the recruitment of young people who are to be beneficiaries of youth empowerment and employment activities under our YOUTH ENTREPRENEURSHIP AND EMPLOYMENT PROJECT, YOUTH OPPORTUNITIES PROJECT, and the NATIONAL CADET PROGRAM. About fifteen thousand (15,000) individuals and households are expected to benefit from these programs, collectively. The Youth Opportunities Project has to date benefited one hundred and twenty-nine (129) communities in all 15 counties. Twenty-eight (28) farming groups comprising a total of three thousand six hundred and twelve (3,612) youths have received the first tranche of labor subsidy cash payments of one hundred and fifty ($150) United States dollars per youth, to assist with some of their needs while on the farms. Under the HOUSEHOLD ENTERPRISE component, one hundred (100) business groups consisting of 8 members in 10 communities across the country have completed their business plans. These are now being reviewed, and accounts have been opened for each business group to received two thousand four hundred ($2,400) United States dollars for business start-up. Under the Productive Public Works component of Youth Opportunities Project, an additional three thousand six hundred and twelve (3,612) youths in 128 communities have been recruited across the country for Round Two implementation. The Youth Opportunities Project is also expected to receive additional financing of 3.5 Million Euros from the Swedish Government and 5 Million Euros from French Government. In addition, over five thousand (5,000) young people have benefitted from our Sexual Reproductive Health Education and Treatment initiatives. Recognizing the importance of literacy in empowerment, the Youth Literacy Program has been revamped and launched in several communities. The Government, with support from the United Nations Development Program (UNDP) rolled out the YOUTHCONNEKT Liberia Program. This is a socio-entrepreneur youth development program that seeks to develop young Liberians into productive citizens. The program supports youth in innovation, ICT, volunteerism, entrepreneurship, advocacy and leadership. Capacity development for our young people remains a matter of high priority for the government. Our TVET institutions graduated about three thousand (3,000) students, with the Monrovia Vocational Training Centre accounting for two thousand seven hundred and nine (2,709) graduates. This was the first graduation since the Ebola crisis. Also, the government have successfully completed negotiations with the European Union on the terms of a 20 million Euro grant, which is meant for the modernization of seven (7) TVET institutions in the country. The execution of this program has begun with the United Nations Industrial Development Organization as implementing partner. The Ministry of Youth & Sports has completed assessments for the re-opening of the other TVET institutions – Tumutu Agriculture and Vocational Training Center in Bong County; Klay Agriculture and Vocational Training Center in Bomi County; and Youth Agriculture Training Center in Montserrado County. We are currently partnering with different organizations to improve and enhance TVET delivery across the country. The ADEA, a working group on education management and policy support, has a five-year project for the development of the oil palm industry in Liberia, with emphasis in nursery development. Thirty (30) young Liberians from the western region of the Country are to benefit from the three-month intensive training in nursery development for the pilot phase of the project to be carried out in Klay Agriculture Vocational Training Center in Bomi County. Despite these peculiar adverse economic circumstances, growth in real gross domestic product (GDP) recovered at 2.5 percent in 2017 and was projected to rise to 3 percent at the end of 2018. By 2023, we expect the economy to grow by a further 4.7 percent, on account of further expansion in commercial gold production, growth in the agricultural and forestry sectors, formation of Special Economic Zones, and other economic reforms envisage under the Pro-Poor Agenda for Prosperity and Development. The average Liberian-dollar exchange rate with reference to the United States dollar, depreciated from L$117 Liberian dollars to $1.00 United States dollar in 2017; to L$157.8 Liberian dollars to $1.00 United States dollar at the end of 2018. At its lowest value before the government intervention, $1.00 United States dollar was being exchange at L$180 Liberia dollars. As a short-term quick fix, the Government approved $25 million United States dollars to enable the Central Bank to intervene in the foreign exchange market. As of December 2018, a total of $17 million United States dollars was used for the intervention, which significantly contributed to the general stability in the exchange rate for the past six months (July to December 2018). The balance $8 million United States dollars is reserved by the CBL as a precautionary intervention fund..
Liberia’s trade deficit stood at $561.8 million United States dollars for the period January to November 2018. Although this represents a 17.1 percent improvement, as compared to $677.3 million for the same period in 2017, it is important to note that the weak performance of the real economy has for so long been characterized by low export earnings as compared to payments for imports. Receipts from iron ore exports almost doubled, from $57.8 million United States dollars, to $106.5 million United States dollars, while rubber exports grew slightly from $67 million United States dollars to $68.9 million United States dollars, compared to the same period in 2017. The GROSS FOREIGN RESERVES at the end of November 2018 was $410.2 million United States dollars, reflecting a slight decline of 1.7 percent compared to the end of December 2017. This slight decline in Gross Foreign Reserves can be largely attributed to low export earnings. Despite the challenges faced in the economy, the banking system remained resilient during the year under review. The banking system further experienced improvement in aggregate assets, deposits, loans and capitalization. Liberia has made progress in deepening the financial system through the national payments system and digital financial space. There has been an uptake in the use of mobile money services across the country as well as the automatic tellers’ machines (ATMs), which has helped to increase access to payment. In addition, the Government requested the assistance of the European Union, the African Union, the United States Government and the Economic Community of West African States (ECOWAS) to help in conducting a separate external investigation into the alleged missing money. With the assistance and support of USAID, an audit team from Kroll of London, England, was invited to independently investigate and report findings. The Report from the Kroll Audit Team is expected at the end of February 2019, and will be released to the public by USAID. REVENUE COLLECTION FOR 2018, INCLUDING GRANTS, WAS $480.6 MILLION UNITED STATES DOLLARS, AS COMPARED TO $454 MILLION UNITED STATES DOLLARS IN 2017, WHICH REPRESENTS GROWTH OF 5.7 PERCENT. To this end, our government is especially grateful to our partners for contributing approximately ten (10) times more in budget support grants in 2018 than in 2017 ($38 million United States dollars in 2018, as compared to $4.8 million in 2017) Tax revenue increased from $384.9 million United States dollars in 2017, to $387.6 million United States dollars in 2018. Non-tax revenue increased from $55 million United States dollars in 2017, to $64.7 million in 2018, mainly on account of active collection of the Road Fund Levy. CORRESPONDINGLY, EXPENDITURE FOR 2018 AMOUNTED TO $502 MILLION UNITED STATES DOLLARS, COMPARED TO $434.3 MILLION UNITED STATES DOLLARS AT THE END OF NOVEMBER 2017. The increase in government expenditures consistently reminds us about the desire of the Liberian people for meaningful developments, which are in line with our Change for Hope mandate. When we came to power, we inherited a debt of $878.2 million United States dollars at the end of 2017. The debt stock now stands at $987.8 million in 2018 at the end of 2018. The increase in the debt stock of $109.6 million during the period under review is mainly on account of disbursements from borrowing external loan portfolios, including the World Bank, African Development Bank, BADEA and Saudi Arabia, which were ratified in 2017. Our administration remains grateful to our development partners for the level of assistance we have received since my ascendency as President of the Republic of Liberia. Total official development assistance received from January up to September 2018 is about $399 million United States dollars in support of various programs and activities under our Pro-Poor Agenda. Of this amount, approximately $279.2 million United States dollars, represents seventy percent (70%) in grants; while the remaining $120 million United States dollars represents thirty percent (30%) received as concessional loans. MADAM VICE PRESIDENT, MR. SPEAKER AND HONORABLE MEMBERS OF THE 54TH NATIONAL LEGISLATURE, it is my singular honor to request this honorable body to join me in expressing our sincere thanks and profound appreciation to our donor partners. As the world’s second largest shipping registry, we have carried out several programs and activities to strengthen, consolidate and expand our maritime program in the face of competition from new and emerging registries. During the period under review, the Governments of Liberia and the People’s Republic of China renewed the favored-nation Maritime Transport Agreement for another five (5) years, thus preserving our access to a vast market in the Far East. Additionally, discussions are in the final stages to conclude a MARITIME TRANSPORT AGREEMENT WITH THE REPUBLIC OF INDIA. The government will continue to explore further opportunities to ensure that the competitive advantage we have as a world class maritime nation is increased to the benefit of the Liberian people. In my Inaugural Address, I stated that my greatest contribution to this country as President may not lie in the eloquence of my speeches, but will definitely lie in the quality of the decisions that I will make over the next six years to advance the lives of Liberians. And, as I have often said, “I am a man of action”. In fulfillment of the goal of the PAPD to connect every county to our commercial capital of Monrovia, we have targeted five hundred and seventeen kilometers (517 km) of paved primary roads. At the same time, we are creating community connectivity through the pavement of Community Roads throughout the country. The Government of Liberia is working with the Ecowas Bank Investment and Development, the African Development, the World Bank and the provide sector to identify and scale up financing for the Coastal Highway. During the period under review, three (3) new segments of primary road projects were initiated: the SANNIQUELLIE – LOGATUO ROAD project of forty-seven kilometers (47 km) with funding from the African Development Bank and the European Union; the GANTA – TAPPITTA – ZWEDRU ROAD project of two hundred and twenty-five kilometers (225 km) with funding from the Liberia Reconstruction Trust Fund. Similarly, the German Government has contributed $16 Million United States dollars and the World Bank has also contributed $29 Million United States dollars to the Ganta – Tappitta – Zwedru Road project and the Gbarnga – Salayea Road project of eighty-one kilometers (81 km) is expected with funding from the Arab Banks. In addition to these gains, the Government of Liberia has secured funding from the Arab Banks, led by the Kuwaiti Fund, for the ongoing Gbarnga to Salayea Road corridor to be extended to Voinjama via Konia in Lofa County, totaling one hundred and ninety-five kilometers (195 km). Our concessionaire, ARCELORMITTAL, has started the GANTA – YEKEPA Road Project of sixty-seven kilometers (67 km), and the World Bank has finalized funding for six kilometers (6 km) of paved road from Coca Cola Factory to ELWA Junction. The Government is undertaking a total of one hundred and fifty kilometers (150) km of Community Roads in fifty-seven (57) communities in Monrovia and its environs, as well as in Gbarnga, Bong County and in Buchanan, Grand Bassa County. These roads are being paved with funding from domestic revenues generated from taxes. I am pleased to inform you that more than sixty-five percent (65%) of community roads are near completion. DOE COMMUNITY TO CLARA TOWN road and CHUGBOR ROAD are completed and dedicated. The Government of India 144 Million commitment to build a conference center named in honor of Mahatma Gandhi to be built on Bali Island. As the Liberia Electricity Cooperation (LEC) has been able to increase its supply out, the demand for electricity also increased. Insufficient transformers and overload led to several communities physically demanding service, sometimes resulting in demonstrations in some communities. The able technicians of LEC were able to mitigate some of the problems by introducing new transformers where needed and replacing damaged overload transformers. There are more than 8000 new household connections, 324 new commercial connections, with 80 new large users added and in the process of being added. However, revenue collected accounts for about 40% of generated load, while power theft accounts for about 49% and technical losses accounts for 12%. There has not been a change in Tariff and that may not change until the problem of power theft is addressed through a policy reform. Statistics showed that 10 % of power theft will cost the Liberia Electricity Corporation $8 million United States dollars. Today, because of the increase in illegal connections, the LEC is losing in excess of $35 million United States dollars per year to electricity theft. Power Theft is ILLEGAL, AND SABOTAGES THE ECONOMY OF OUR COUNTRY. I appeal to you, my fellow Liberians, to stop this behavior of power theft NOW!! The Liberia media remains vibrant and unfettered. Currently, there are more than seventy privately owned (70) radio and television stations with over 40 newspapers operating in the country. The media is a fundamental pillar of our democracy. While we applaud the plurality of the media, we have also engaged the Press Union of Liberia to devise ways of enhancing professionalism. Because we have an obligation to provide factual information about the development agenda to our citizens, we have ramped up the efficiency and capacity of the government’s own national media outlets. The national broadcaster, Liberia Broadcasting Corporation (ELBC & ELTV) has extended its coverage to leeward counties. In an effort to further disseminate information to the populace, the government has signed a $10 million United States dollar Grant Agreement with the Government of the People’s Republic of China as support to the LBS decentralization program. The Ministry of National Defense continues to ensure professional military training for soldiers and is working with international partners in restructuring a credible defense sector that would maintain the peace and provide the enabling environment for the implementation of the Pro-Poor Agenda for Prosperity and Development (PAPD). In February of 2018, the Armed Forces of Liberia (AFL) conducted two successive rotation exercises to reach a total of five rotations since the beginning of the Mission. Liberia continues to foster friendly and mutually beneficial ties with her traditional partners as well as explore new relations with countries sharing similar world views based on friendship, peace and cooperation in pursuit of her national interest. August 27 – September 6, 2018: I led a high-powered delegation to attend the Forum on China-Africa Cooperation (FOCAC) Summit in Beijing, China. During this visit, the Government of Liberia and China signed a $54 million United States dollar grant to Liberia to aid the construction of two overhead bridges to ease traffic movement at the Ministerial Complex and the SKD Boulevard respectively. November 9 – 15, 2018: At the invitation of the President of France, I paid an Official Visit to the Republic of France to attend the Paris Peace Forum which brought together more than Seventy (70) world leaders. During the occasion, had the opportunity to meet other world leaders. While in France, I was invited to attend the Internet Governance Forum organized by the United Nations Educational Scientific and Cultural Organization (UNESCO) as a Guest of Honor. In my submission I highlighted the significance of Internet in bridging communication gaps in the world, as well as called attention to the dangers of the misuse of this new technology for both countries and their citizens. It is noteworthy to report that Liberia’s relation with the United States is cordial, harmonious and mutually fruitful. Both countries enjoy strong relationship which is characterized by mutual respect. America is a traditional ally of Liberia and both countries continue to collaborate at the bilateral and multilateral levels, which led to a recent and significant signing of a $120 Million United States dollars grant between USAID and Government. Hon. Lemuel E. A. Reeves, Sr.
Hon. Sandei A. Cooper, Sr.
Former Deputy Governor, Central Bank of Liberia; Senior Vice President for Operation, Erstwhile Citi Bank; Treasurer and Chief Financial Officer respectively. Hon. Alfred Boimah Anderson, Jr. Superintendent, Monrovia Consolidated School System, President, Cuttington College and Divinity School. Long before the drafting and completion of the PAPD, our administration started immediate implementation with the Recast Fiscal Year 17/18 National Budget. With the re-balancing, we were able to generate $9.6 million United States dollars in savings through expenditure cuts, including reductions in the salaries of all top-level government officials. With your approval as Members of the National Legislature, we used these savings wisely to fund Thirteen (13) Pro-Poor Projects. Today, I am pleased to inform you that most of these deliverables, consisting of our first Pro-Poor programs and projects, have now been successfully completed. Some of the major successful programs and projects include: digitizing the University of Liberia registration system; sending medical doctors abroad to specialize; feasibility study of the 14th Military Hospital; upgrade of JFK and provision of the roads maintenance and the payment of the Resettlement Action Plan. Additionally, a new Presidential Lounge is being constructed at RIA to accommodate visiting Heads of State. In addition, three (3) new dedicated jetty lines were installed at the Petroleum Storage Terminal (PST) on Bushrod Island. Another major milestone in the PST rehabilitation and expansion project was achieved with the completion of Three (3) new storage tanks. These tanks enable the Government to store more petroleum products. In the face of rising global prices, the government has been able to reduce the basic prices of fuel on the Liberian market. Fuel prices have been reduced as follows: Gas: 3.70 reduce to 3.30 and AGO has been reduced from 3.95 cents to 3.70. Likewise, the price of an ordinary passport has been reduced by 10%, from $50 to $45. THIS WILL HAVE TO CHANGE!! Just as I am doing with the roads, I will directly get involved in the programs and practical implementation of agriculture development. The sector accounts for more than seventy percent (70%) of household earnings. Therefore, our Pro-Poor Agenda for Prosperity and Development can only be sustainably achieved through agriculture. We will craft new practical and realistic agriculture policies, incentivize the sector by providing access to credit, reducing tariffs on agriculture implements, and provide small machines, modern seeds and fertilizers. As I said before, and continue to say, Liberia is open for business. Under this administration the private sector will be prioritized. With the passage of the new Special Economic Zone Law, we will create one-stop shop business zones for the private sector. We have for long spoken about adding value to various raw materials to create more jobs, income and livelihood for our citizens. It is time we take practical action to make it happen. Survey of the Buchanan port has already begun on land that is allocated for the establishment of an SPECIAL ECONOIC ZONE, and in this fiscal year we work with our international partners to complete the feasibility studies. We will shortly place before you, the Legislature, a proposed amendment to extend the time required to renew Resident Permits. In Liberia we have business people who have lived here for 30 to 50 years but have to renew resident permit every year. THIS WILL HAVE TO CHANGE! 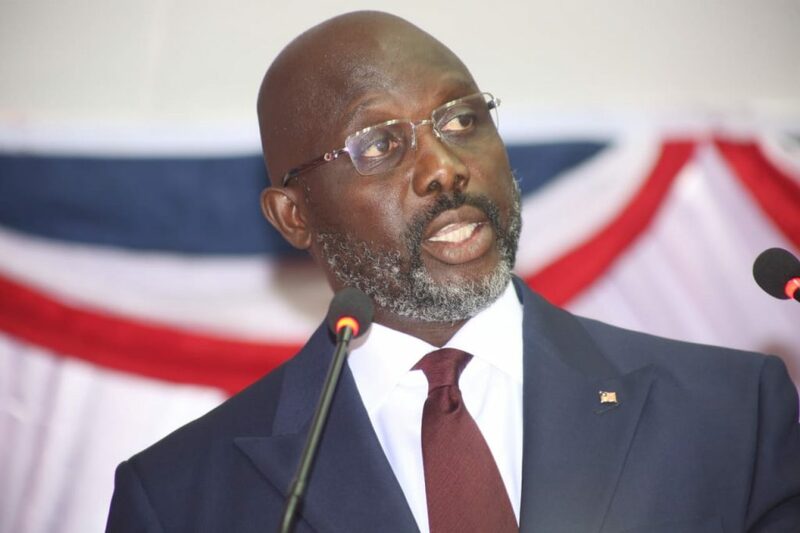 People who have already resided in Liberia for five years or more, without a criminal record, will be eligible. And that is why we have started our second year with a new mindset…a patriotic mindset geared towards total development, economic growth and empowerment. FELLOW LIBERIANS, thank you for standing with us! Thank you for your prayers and support! LONG LIVE LIBERIA, HAPPY LAND! !